Do you hibernate when Winter comes? I’m a homebody at heart and during the Winter, it gets worse (or better) depending which side of your fence you stand on :-) I almost found myself being relieved when friends cancel drinks in town or when it rains heavily so I don’t have to cross the whole of London to attend a cool event because the bottom line is, there is no place I’d rather be than being at home… yeah I know, I’m too rock’ n’ roll! 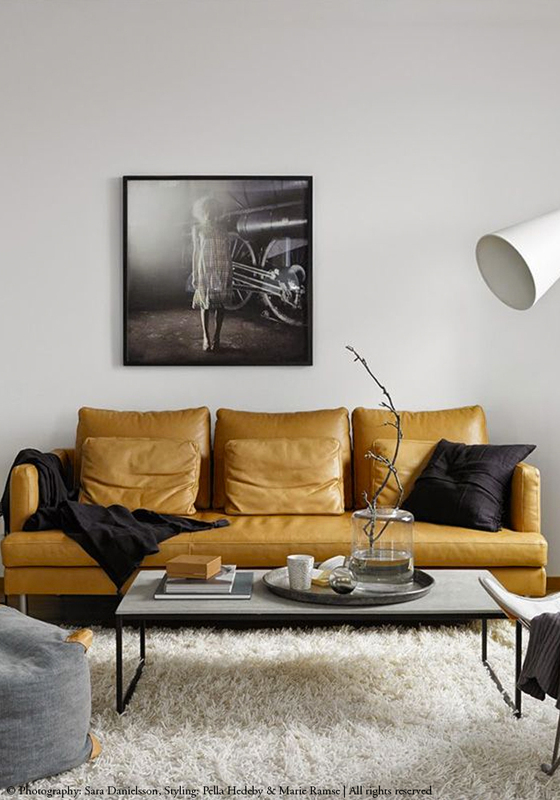 The thing is when the home is filled with things that make you feel good like curry, mustard, ochre and warm yellow hues that add an incredible sense of warmth, the kind that wraps you up and make you feel good inside…well you stay in ;-). In the lounge, a simple throw or sofa can create a sense of wellbeing. 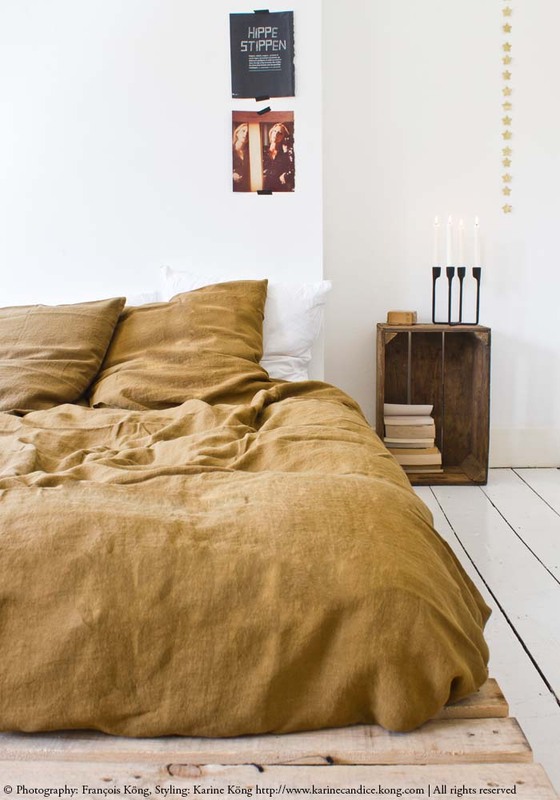 In the bedroom, I can get enough of this soft, stonewashed duvet cover in curry, which I styled on a bed base made out of 4 industrial pallets in our guest room…such a beautiful, warm colour for the Winter, cold nights…. 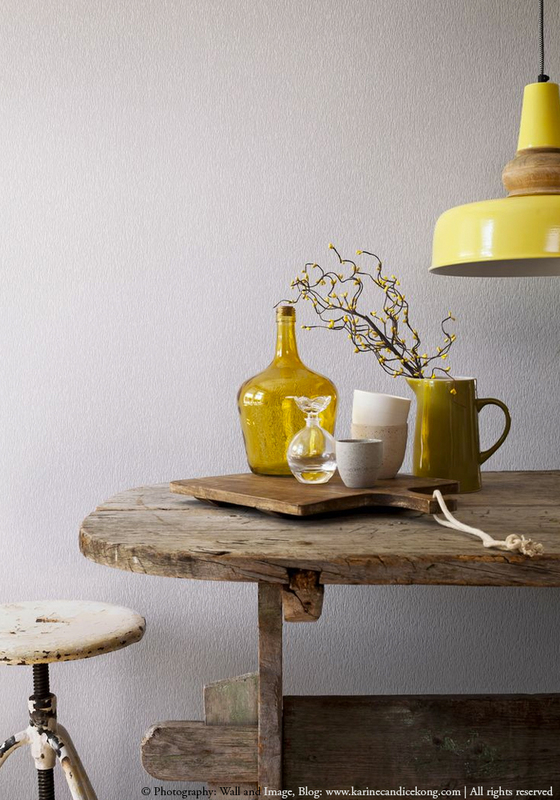 Adding simple glassware from the 60s & 70s sourced from flea markets or eBay, some wooden chopping boards and mix them with textured ceramics is also a great way to bring warmth to your dining table at very little cost. I love when Mother Nature becomes part of the styling process like these simple but beautiful wreaths. Hi! Could you please share where did you get that stonewashed duet cover in curry from? Thanks!! I got it from my e-shop but since I sold the eshop in January 2016 and the new Owner is not doing anything with it, I dont think it’s available. I was the only one in the UK to stock this brand, which is a French brand called Linge Particulier.